Update: Check out our real-time presidential candidates missed votes tracker. The 2016 presidential candidates are under a lot of scrutiny right now, and the five who are sitting senators even more so. Sen. Marco Rubio in particular has been the focus of criticisms that he hasn’t showed up to work, starting in February following a Vocative article and most recently a Washington Post article just last week (both based on our data). Rubio and fellow candidate Sen. Ted Cruz currently hold the #2 and #3 spots in the Senate for highest percentage of missed votes throughout each senator’s career. (At 11% each, they’re topped only by a senator who suffered a stroke in 2012 and missed a year of service.) But what about the other candidates? We compared all five candidates who are sitting senators plus former senator Hillary Clinton, who was a senator when she ran for president the first time in 2008 and is now running again. To make it a fair comparison, because not all of the candidates have been serving the same length of time, we looked at only the votes in the last year — the time period when the candidates were running for president. And to compare with Clinton, we looked at her votes during the corresponding time period prior to the 2008 election. They’ve all missed a lot of votes — well, all except Sen. Rand Paul who is close to the Senate-wide median of 1.1%. Rubio takes the lead here at 26% of votes missed, with Graham (20%) and Cruz (20%) not far behind. Sanders, who is still considered a long-shot, missed 11% of votes. They were all eligible to vote in 379 votes. Clinton missed 13% of votes in the corresponding one-year time period that, like today, was 378 days ahead of the 2008 election. As you’ll see next, our sitting president missed even more votes than the current candidates when he ran for office. 2016 won’t be the first election when presidential candidates took a rain check on their day jobs. We looked at some of the 2008 candidates during the same one-year time period that, like today, was 378 days ahead of the election. Back then, it was Sen. John McCain (51%) and Sen. Barack Obama (29%) who lead the absenteeism, and it seems like it paid off because they were the candidates who won their party’s nomination. Clinton, who lost the Democratic nomination to Obama, was a little further behind at the 13% mentioned above. 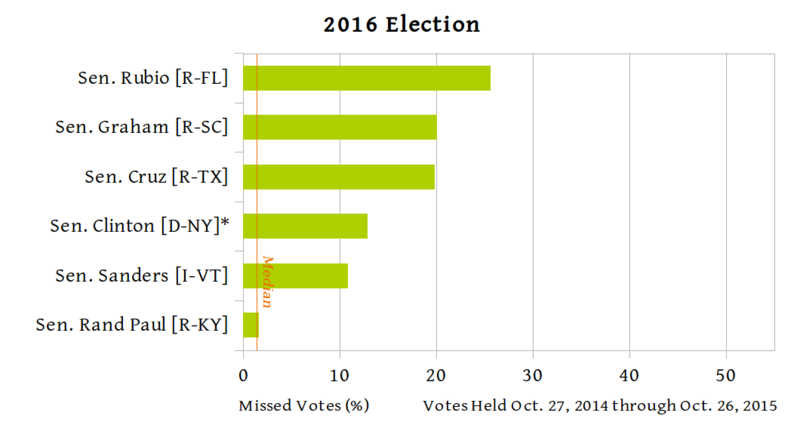 The median percent of missed votes across both chambers of Congress was about 2% at the time. The representatives were eligible to vote in 1,009 votes during this time (982 for Bachman because she took office in 2007) and the senators 396 votes. 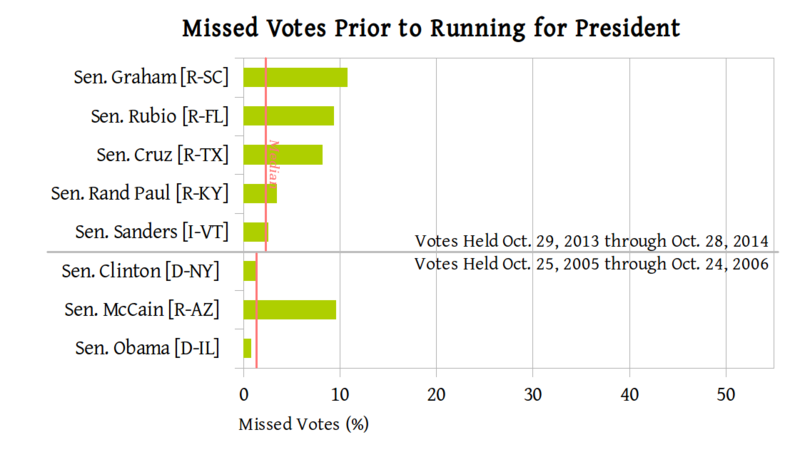 Joe Biden, a senator at the time, also ran in 2008, and missed 34% of votes during this time period. He became Obama’s running mate, and then vice president, and he was considered a likely candidate for the 2016 election, but he recently announced he had declined to run. As you can see, they missed far fewer votes prior to running for office. Graham, Rubio, and Cruz all missed around 9.5% of votes during this time. Paul at 3.5% and Sanders at 2.6% were close to the median across all senators during this time of 2.2%. 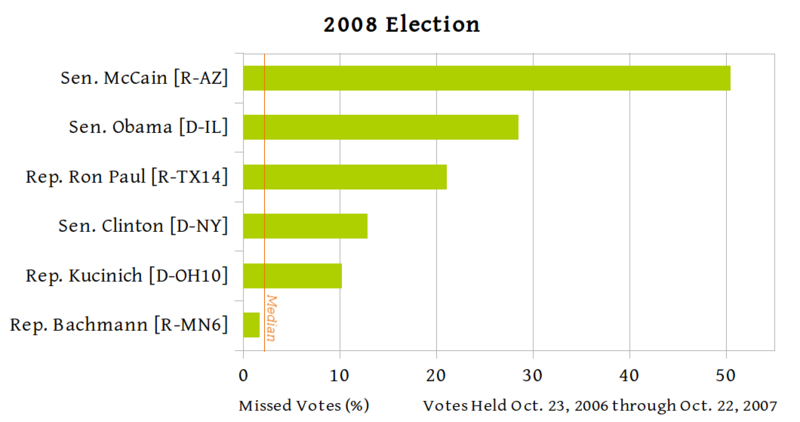 Clinton, during the corresponding time period prior to the 2008 election, missed 1.4% of votes, which was right on the median for senators during that time. Similarly for Obama (0.8%). McCain missed 9.6%. Biden, again not shown, missed 10.5% of votes. UPDATES: In the last paragraph I corrected the year of the last election to 2012 — of course not 2010. Ooops. On Oct. 28 I added a section about the candidates’ votes prior to their run for office. Bernie is a long shot, eh? I expect this from the Main Stream Media, but here too? Unnecessary comment. In the last paragraph there is a reference to 2010 but I’m sure that should be 2012. More importantly, what were the votes that they missed? The naming of the Post Office or a vote on TTP? And calling Sanders a long shot is the typical slant for the pro-corporate media. What I want is a readout on votes for all the critical issues for the past 4 years, the wars, bailing out wall street, GMOs, Keystone Pipeline, universal healthcare, votes that would actually change (improve) life for everybody in this country, and maybe might spread to the planet. These candidates were elected by the people to represent them in the senate. They were not elected to run for president. They decided to run for that position on their own accord. They have a job to do and they’re are not doing it. If you listen to Rubio, he comes off as saying politicians have a right and are privilaged to be absent and miss votes in the senate when they’re running for the top position? I say, if it were you or I and we missed work at our regular job in order to pursue another occupation we would be fired in a heart beat. To make matters worse, Rubio and others are still collecting pay checks from the taxpayers for doing nothing in the senate and they’re content to pocket that money which they think they’re deserving of. They should be made to forfiet their salaries as a requisite to run for another position in government while holding another. This is just one of the many examples of political entitlements that would never be afforded to average Americans outside of corrupt Washington, DC. It is clear that this editorial board has a liberal agenda. More “unbiased” MSM. You still haven’t controlled for time and what you have isn’t what you want. You want to know how many votes the candidates missed after they announced their candidacy. You’re counting votes missed before they announced. They (those votes) have nothing to do with anything (at least in this particular exercise). BD, did you even bother reading this article? For the time periods given, all of this information is accurate. And even in the CNN article you linked to Obama missed 80% of votes from Sept. of that year to when that article was published (November). This is why no one can take you seriously when you scream MSM bias.